This small House of Worship uses the BSS Soundweb London BLU-160 and BLU-120 in the system design which provides flexibility at a cost effective price point. This design utilizes BLU link as the primary digital audio transport and HiQnet over an Ethernet network for control. Using BLU link as a digital snake has the benefits of low latency and very small infrastructure requirements. In a retrofit scenario there may not be conduit in place to use traditional multi-pair copper audio snakes. BLU link utilizes standard CAT5e cable or fiber optic pairs to interconnect devices, requiring much smaller conduit or cable chase. This allows for the use of surface mount cable chase in retrofit situations where conduit is just not an option, such as an old stone church for example. At the stage location we will use one BLU-160 and two BLU-120s, each loaded with three input cards and one output card, providing 36 input channels routable as needed to the 32 Si Performer console inputs. A dbx PMC-16 BLU link personal monitor mixers provides outputs for the stage monitors in addition to the 12 output jacks on the wall plates. At the mix position there are also local inputs on the mixer for audio sources such as CD players or Apple iPods. With a WiFi enabled iOS device, we also have the ability to control the stage microphones with the HiQnet Motion Control app when the system is in automatic mode. In manual mode, the mixer at the front-of-house location provides the control for the stage microphones. In this House of Worship the system can be used in one of two ways. 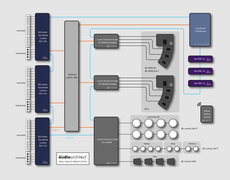 The first four inputs are routed to the BSS Audio Soundweb London BLU-160’s Automixer Gain Sharing processing object to allow a simple service - with four microphones or less - to take place without a sound operator. For more complicated services, the other 32 inputs on the wall plates are routed to the console’s inputs. A ducker is provided to automate the switching between the two systems, giving the automixed signal a priority over the console’s feed. Shown on this diagram are the first 8 wall plate inputs routed to the console. The remaining 24 wall plate inputs are routed similarly from the two BLU-120 units via BLU link to the Si Performer console. Stereo outputs are routed to the main speaker system while a mono sum is routed to back-of-house amplifiers. Each speaker or zone has a Gain, a Parametric EQ and a High or Low Pass Filter, with delay and limiting built in. There are also four outputs on each plate routed through each processor via BLU link from the console for use as monitors or for recording.